Roof sheets have grown in popularity over recent years, due to developments in the manufacturing process meaning that roof sheets are a viable alternative to more traditional roofing materials. From leading experts such as Onduline, Ariel Plastics, Marley and more, there is a continuously growing range of products available. 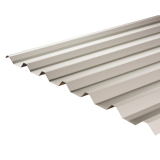 Choose from corrugated metal roof sheets, box profile metal roof sheets, twinwall and multiwall polycarbonate roof sheets and more, along with a wide variety of sizes, colours, thicknesses and other customisable options. If you need any advice or recommendations on the best roof sheets for your project, whether it is large scale industrial buildings or for a small scale DIY project, our team of roofing experts is ready to help. 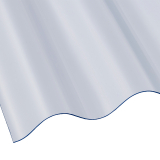 Give the team a call on 01752 692760, or alternatively use the live chat at the bottom right hand of the page for any questions you may have, or read on to find out more about roofing sheets. Whether you’re looking for ways in which roofing sheets can be used, the different types of material and profiles available in roofing sheets, or the advantages of roofing sheets over more traditional roofing methods, we’ve got it covered. Where are roofing sheets used? Roofing sheets, or roof panels, are incredibly popular in a wide range of applications, from domestic roofing, garages and outbuildings to agricultural and commercial structures. Roofing sheets are commonly used to roof agricultural buildings, due to the large sizes of roof sheet available – the roof of an agricultural building can be massive, and if a more traditional method of roofing was used it would take a long time to install. Additionally, translucent or transparent roof sheets can be combined with opaque roof sheets to allow light ingress without the need for electricity, minimising energy bills. Roof sheets are also popular on agricultural projects when the buildings are used for storage of biological materials or animals – the roofing sheets allow some levels of natural ventilation, whilst also helping to retain heat in the winter, and reduce heat absorption in the summer. Roof sheets are incredibly popular choices of roofing material on industrial buildings, due to the quick and easy installation, as well as the high strength and impact resistance. When working on industrial projects, costs, time and performance are key, and roofing sheets ensure that costs and time are kept at a minimum, whilst the building is kept weatherproof, secure, and protected from any adverse weather conditions. Roof sheets, particularly twinwall and multiwall polycarbonate roof sheets, are a great option when building or restoring garden outbuildings. Allowing daylight into the building, whilst retaining some heat and ensuring the contents of the building are kept protected from any weather conditions are great benefits, whilst the quick and easy installation process means that it can be fitted by anyone with limited DIY knowledge and experience. Roof sheets are lightweight, easy to handle and waterproof, meaning they are the perfect option for a carport or garage. A combination of opaque and transparent roof sheets can be used to allow natural light into the room, or alternatively opt for metal roof sheets to provide a long term, durable roofing solution. What are the advantages of roof sheets over traditional roofing? Roofing sheets have a wide range of benefits when compared with more traditional tiled roofing. Firstly, roofing sheets are incredibly versatile – they can be used in a wide range of different applications, buildings, projects and situations. Roof sheets are manufactured from a number of different materials, and come in a number of profiles, colours, sizes and thicknesses. This means that the roof is almost entirely customisable, allowing you to choose the characteristics you require to create the roof you envision. Roofing sheets are incredibly lightweight when compared with more traditional roofing materials such as tiles. Roof sheets are generally quite thin, which reduces the weight of the material, meaning that transportation, handling and installation are quicker and easier. Roof sheets are often chosen due to the quick and easy installation process. Roof sheets are generally provided in large sizes, which means that less modules are required in order to fit an entire roof, compared to the number of roof tiles required. This means that the installation process is quicker, as less fixings are required, and it is also more straightforward than traditional tile installation. Quicker and easier installation means that a professional is not always required on smaller projects, but if a labourer is required, labour costs are lower due to the speed at which a roof can be completed using roof sheets. 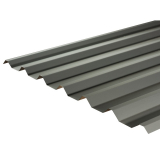 Roof sheets are most commonly manufactured with a corrugated profile, which provides the perfect solution to water build-up – the corrugated shape helps encourage any water to run-off into guttering at the bottom of the roof. However, even if you’re opting for a different profiled roof sheet, water run-off is still encouraged when compared with more traditional tiles roofing, as the surfaces are much smoother, with less joins that can prevent efficient water drainage. 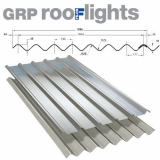 Roof sheets, regardless of the material they are manufactured from, are corrosion resistant. Metal roof sheets are treated or coated with corrosion resistant coatings, whilst other roof sheets are manufactured from corrosion-resistant materials. Additionally, roof sheets are often chemically treated, meaning that they are also resistant to the growth of algae and other matter. Roofing sheets are incredible cost effective. Installation is quick and easy, meaning professionals are not required for installation, and if you do opt for a professional, labour costs are minimised due to the short time required. The lightweight properties of roofing sheets also mean that transportation costs are minimised, and the durability, strength and resilience of roofing sheets result in a long lifespan that makes choosing roofing sheets incredibly cost-effective. Here at Roofing Superstore we offer a cut-to-size service for Polycarbonate and acrylic roofing sheets – this helps to further increase the cost-effectiveness of roof sheets because it minimises wastage and ensures you have the correct sized roof sheets required for your project. What are roof sheets made from? Bitumen roofing sheets are manufactured from bitumen fibres – a mixture commonly used in roofing and road surfaces due to its durability. Bitumen roof sheets are lightweight and tough, meaning that they are able to withstand a wide range of weather conditions with no adverse effects. There are a range of options available when choosing a bitumen roof sheet, from the colour of the roofing sheet to the thickness and size. Coroline bitumen roof sheets are 2.6mm thick, whilst Onduline roofing sheets are 3mm thick. 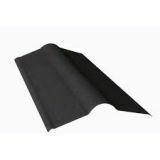 Both brands of bitumen roof sheet are high quality, with years of experience in the manufacturing of durable and long lasting roofing solutions. Polycarbonate roofing sheets are manufactured from a synthetic resin, which carries a number of similarities to plastic but with added benefits. Polycarbonate roofing sheets come in a wide range of thicknesses, glazing options and styles, meaning the perfect roof can be created to allow levels of daylight into the building whilst retaining a waterproof, secure and strong roof. From corrugated polycarbonate roof sheets, to flat glazing sheets, and the option for twinwall, triple wall or even multiwall polycarbonate roof sheets, there are a number of options to choose from. 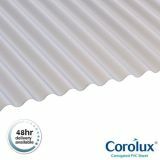 Choose from high quality, reputable ranges of polycarbonate roofing sheet such as Corotherm and Corolite, part of the Ariel Plastics brand, the Marlon Clickfix range which provides a quick and complete polycarbonate glazing system, or Axiome’s range of twinwall polycarbonate roofing sheets which are the result of years of technical development and improvements. 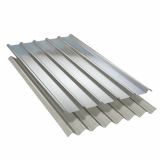 Metal roofing sheets are some of the more traditional and well-known roofing sheets available. 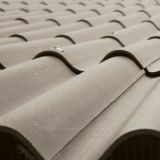 Manufactured from lightweight yet hardwearing metals, and often with a coating manufactured from zinc or PVC, metal roof sheets come in a number of different profiles, including popular tile-effect profiles to emulate a more traditional tiled roof. Cladco provide a range of box profile roofing sheets manufactured from metal, or alternatively opt for Britmet’s Ecopan metal roof sheets, designed to emulate roof tiles but with the benefits of metal roof sheets. 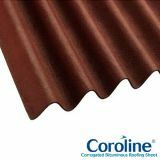 Corotile also provide a metal roof sheet range that has been manufactured to appear as traditional pantiles to the naked eye, whilst being much quicker and easier to install than the traditional product. 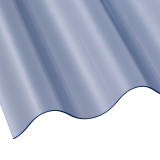 Fibre cement roofing sheets are manufactured from a mixture of cement and fibres. This creates a strong and durable material that is extra strong due to the fibres holding the material together. Fibre cement roof sheets are typically corrugated, and commonly used in agricultural and industrial roofing, but can also be used in smaller, domestic projects. 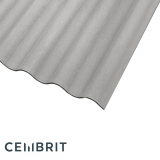 Cembrit’s Big Six fibre cement roof sheets range has been manufactured with 6” corrugations, classically used on large scale agricultural and industrial buildings, or alternatively opt for the Profile 3 to 6 ranges from Marley – the smaller profiled fibre cement roof sheets are easier to handle for smaller projects such as outbuildings and garages. 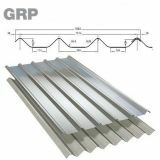 GRP roofing sheets are most commonly used as alternatives to roof windows. Glass Reinforced Plastic is a material that is reinforced with glass fibres to add strength whilst retaining the lightweight properties of plastic. 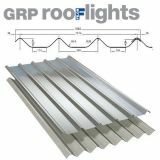 GRP roof sheets allow the transmission of daylight, whilst controlling the amount of UV that passes through, helping to minimise UV damage to furniture, animals and any other products below the GRP rooflight. 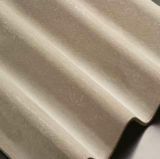 Farmlite GRP roof sheets have been designed to provide a strong and durable solution to roof sheets, allowing natural light into the building whilst preventing yellowing of the translucent roof sheets, and increasing the lifespan of their roof sheets to more than 25 years. 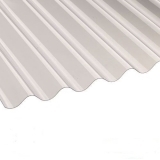 What are the different profiles of roof sheet? 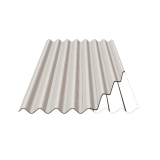 Corrugated roofing sheets are the most common profile roofing sheets available. 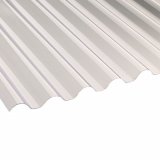 Designed with undulating profiles, corrugated roof sheets provide a structure that has reinforced strength and impact resistance. Corrugated roof profiles are known for their resistance to adverse weather, as well as having the best profile for allowing water run-off, reducing the build up of surface water which can cause issues. Flat profiled roofing sheets are a good choice for buildings where the overall style is a minimalistic, clean and linear finish. Flat roof sheets create a clean and simple finish to the roof, whilst being easy to install and with minimal visual impacts. 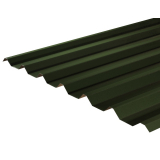 Box profile roof sheets are becoming increasingly popular, often chosen over corrugated profile roof sheets. 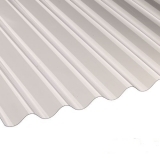 Box profile roof sheets are similar to corrugated roof sheets in that there are peaks and troughs, but instead of being an undulating profile they consist of sharper, linear edges. This makes them strong and able to withstand impacts, whilst also providing an alternative aesthetic style. 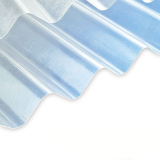 Polycarbonate roofing can be single sheets, or alternatively layered. Twinwall roofing sheets are double layered, whilst triplewall roofing sheets are triple layered, and multiwall roofing sheets are up to 7 layers thick. Opting for multiwall roofing sheets adds extra insulation, rigidity and strength, as well as extra structure – meaning larger sized sheets can be used with no negative effect on the strength and impact resistance of the roof.